to make a spinning wheel! In fact the toughest thing you may need to do is wield a pair of scissors! This page is a collection of some of the most ingenious wheel plans that I have come across, and a homage/tribute to their inventors/makers. I haven't tried everything myself, but since their creators are happily spinning yarn on their spinners, that speaks for itself! It is also a work in progress, and if you find a page that should be added here, please let me know at kero1au at lycos dot com. Thank you. Pride of place goes to Franco and his ingenious cardboard charkha. This is a working model, and he even provides videos of how to use it! 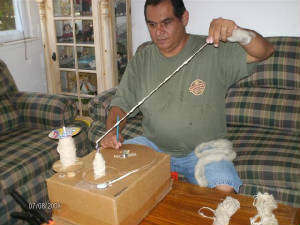 He has taken the Ghandi-style charkha, and created a spinner which will handle thicker as well as the traditionally thinner yarns that a charkha spins, and is simple enough for a child to use. Many home made wheels are a variation on the upright charkha, and are quill or spindle wheels rather than flyer wheels. While this may require a different style of spinning, spindle wheel users like myself will tell you they are far more versatile than you think, and are ideal for the fancy modern decorator yarns that refuse to go through the orifice of the traditional flyer. They have an added advantage, they are very cheap and easy to make! Rosemary's blog is well worth reading and referring back to; she is an ingenious lady who generously shares her discoveries and techniques, and she covers more than just knitting as she makes her own jewel spindles and knitting needles. Or you can set up your own spinner; diagram and instructions below for an electric spindle powered by a sewing machine motor. Its not that hard to make an electric spindle. I adapted a navaho style spindle, with its extra thick whorl attached, and modified it by filing a groove in it to hold a drive band, turned by a sewing machine motor. The maidens are simple uprights with a hole in one and a U shaped open-ended slot in the other (failures from my Mayan spinner). They are screwed into a short length of wood that is bolted to the base. For a drive belt I use a cotton shoelace, of the type that does not stretch. To prevent the yarn getting tangled with the uprights, I have added a round drinks coaster (see photo below). I added a small dot of velcro on the back to hold the leader yarn: not an idea thats mine, much as I would love to claim it. I found my first velcro dot on my Babe charhka and have since added one to all my bobbins. I was unable to keep the reverse switch from the motor. If you know a bit about electrics, try to keep it as then all you have to do is flick a switch. I just reverse my drive band. If you follow the link to Babes Fiber Garden below, there is a page there with instructions for the upright charkha (Liten Spindle), and it includes winding on without stopping, so getting around the need for a reverse switch. I was also lucky enough to get hold of an old Ashford look-a-like, with a badly damaged wheel. It had an intact flyer unit, including maidens, that takes standard Ashford bobbins, so it was not too hard to attach that to my sewing machine motor, find another length of shoe lace for a drive band, and set it up. That is still a work in progress as I have a second sewing machine motor and can make it an independent unit. It is possible to pick up second-hand flyers for very little, and set your own electric spinner up, as many people will gladly give their old heavy sewing machines away, complete with working motor! Despite a spindle wheel being a sideways spindle, adapting the spindle technique to the horizontal can be fiddly. One trick I found when I was learning was to put a tiny circle of sewing cotton on the tip, held in place by a glue which is easy to get off. This was enough to stop the fibres from sliding off the tip of the spindle, so I could concentrate on what my hands were doing. Once I had that aha moment, I was able to simply remove it. Babes Fibre Garden has a great instruction page for spinning on a charkha (below the assembley instructions for the Liten Spindle). Babes Fiber Garden charkha spinning instructions. And I found a lovely video on You Tube of spinning on a great or walking wheel. the technique is the same. 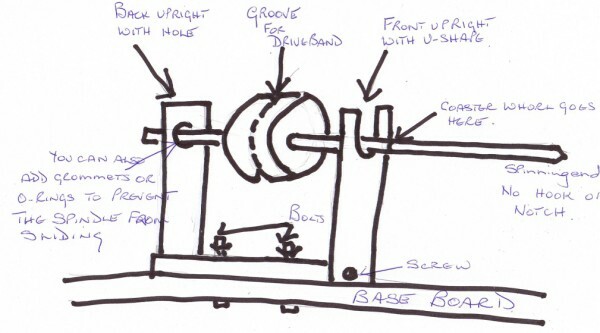 Notes on adapting sewing machine motors. Most sewing machine motors can be adjusted - its important to keep this as it can be used to adjust the tension on the belt if it becomes slack, as they do over time. Drive belts can either be rigged up as I did it, or a vacuum cleaner or washing machine belt will provide hours of service. Make sure the motor is firmly attached to the baseboard. I side mounted mine so you can adjust the tension, then screwed the wood to the baseboard with 2.5 inch screws, probably overkill, but its not coming loose any time soon! I also added rubber feet, mainly to allow for the screw heads, but it also helps dampen any vibration. A spot of sewing machine oil on the wooden maidens where they hold the spindle, and away you go. I will add leather or nylon bearings at a later date which will help with smooth running. I have included Babes Fiber Garden on this page, because Nels Wiberg, the inventor of those terrific PVC wheels, is perfectly in tune with the spirit of DIY spinning. Although his wheels are sold as a commercial venture, they help support a sheltered workshop, and provide a very cheap alternative for those who are unable to make their own equipment. As the owner of a Babe Liten Spindle myself, I am of course biased, but I have come across many unsolicited comments about Babe wheels. They come highly recommended, and are considered by many spinners to out-perform their more expensive wooden cousins. And can you think of any other spinning wheel you can easily dismantle and store in a tote bag?